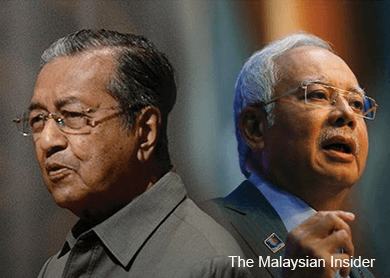 (June 4): Tun Dr Mahathir Mohamad believes that Prime Minister Datuk Seri Najib Razak will lose the next general election and this would risk legal action over cover-ups in the 1Malaysia Development Bhd (1MDB) debt scandal. The former prime minister and Najib's main supporter turned critic also said there is evidence of cover-ups in 1MDB's RM42 billion debt, which now requires a restructuring. "There are too many evidence of cover-ups by politicians and civil servants. When Najib is defeated and I believe he will, in the next election, there will be no stopping the legal actions which must follow. "I hope the restructuring will help but unless the lost money is returned, paying off debts will absolve no one," Dr Mahathir wrote in his popular blog chedet.cc. Criticism has been mounting over the Finance Ministry's wholly owned investment vehicle, established in 2009, which has chalked up debts of up to RM42 billion, backed by Putrajaya. Najib has been under pressure from opposition politicians, current and former Umno leaders, including Dr Mahathir and anti-graft bodies, who have demanded a thorough investigation into the fund. Dr Mahathir, in continuing his tirade against the Najib administration for weak leadership and in particular, over 1MDB, reiterated that the repayment of the debts through the rationalisation plan would not absolve the fund of losing the money in the first place. "The money is not lost through bad businesses but has simply disappeared. Somebody knows how the money disappeared and who has the money now. But that somebody is not telling," the retired statesman said today. Malaysia's longest-serving prime minister had previously urged the authorities to act against Najib whom, he said, was caught lying about 1MDB's US$1.103 billion (RM3.6 billion) allegedly kept at BSI Bank in Singapore. He said any "cover-up" or attempting to hide a mistake in government affairs was an offence under the law. It was an offence under Section 218 of the Penal Code, he said, noting that the police should investigate the matter. "Something serious is happening. Money owed by a government-owned company, of which RM7 billion is guaranteed by the government, can no longer be traced and attempts are made to lie to Parliament and the country," he had said. "There is an element of crime in this case, which needs the police to investigate, and if the money cannot be found, then the legal process has to be taken against the relevant parties."